Generally Ready in 5-10 minutes. **We have sizes on file for many countries, but just in case, please bring your paperwork with dimensions. *An appointment is required at the Post Office to submit application. You can call 707-462-3231 to make that appointment. Click here for U. 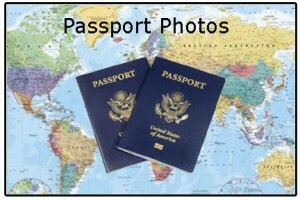 S Passport Application and Information. How long will it take to get a passport photo? Typical turn around time is 5 minutes. If your lab is extremely busy when you come in, it may be up to 20 minutes. Can I wear glasses in my photo? You cannot wear glasses. If you cannot remove your glasses for medical reasons, please include a signed note from your doctor with application. Can I wear jewelry or a hat? You may keep your jewelry on but you must remove any head coverings unless in the case of religious attire that is worn daily. Scarves and turtlenecks should also not be worn. Can I smile in my photo? Unfortunately, a closed mouth neutral expression is required for your passport photo. My baby needs a passport photo, can you do that? Yes, please make sure your baby is awake when you bring them in. Their eyes do need to be open. What should I wear? Everyday clothing is best. Please do not wear a uniform. We suggest something with color, since you will be on a white background.